There’s no shortage of ways to book hotel rooms online, but most services have only the most basic information about one of the most important factors — the quality of the room itself. A new Sunnyvale, Calif. startup called Room 77 says that it has built a database of more than 425,000 hotel rooms at 2,500 properties with information like room category, square footage, bed type, and and elevator proximity. It also taps into Google Earth to create a Room View, showing you a simulation of what you’d see if you looked out the room window. The results are personalised too. 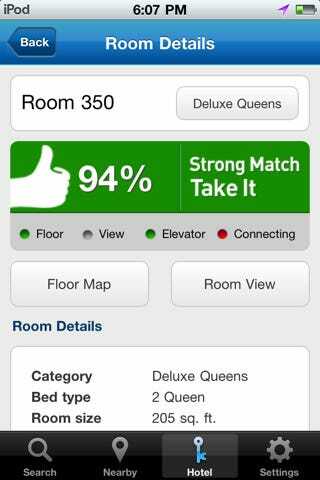 Room 77 says it uses an algorithm to rank rooms based on how well they match the preferences you’ve entered. It sounds like that’s even more useful if you’ve got the Room 77 iPhone app — if you’re at the desk of a hotel and they say they want to place you in a certain room, you can check the app and it will recommend whether you should accept the room or ask for another. “All hotel rooms are not created equal, and we’ve built Room 77 to open up room data and give travellers more control in getting a great room,” said founder and chairman Brad Gerstner in a press release. “travellers have several options that rate and review hotels, but until now there’s nothing that breaks down hotel rooms even though the room is a critical part of the experience.”Room 77 is demonstrating at the Launch conference in San Francisco this morning. One of the big hits at the conference yesterday was Hipmunk, which is bringing a new approach to flight search. When writing about Hipmunk and other flight search companies in the past, VentureBeat’s Matthew Lynley has wondered whether hotel search was the real opportunity. Looks like Room 77 agreed. The company has raised $3 million in funding from Gerstner, Rich Barton, Bob Pittman, Hugh Crean, Par Capital Management, Sutter Hill Ventures, Felicis Ventures (whose founder Aydin Senkut also invested in VentureBeat), and others. This post originally appeared on VentureBeat.